started a new Monthly Card Kit program in January 2016!! *Been looking for a way to get into card making? *Don't have all the tools to create special cards? *Can't get to a class at the shoppe OR just want to make more card than just what you do in class? 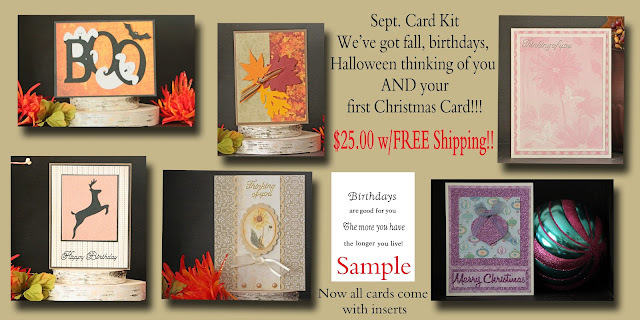 *Then these are the Monthly Card Kits for just what you need!! *A variety of six all occasion cards with envelopes and now greeting inserts and a picture guide with easily extra written instructions if needed. 4 1/4" x 5 1/2". Shipping is FREE! *Kits will be presented by the 15th of each month. Payment due by cash, check, credit card or PayPal. Kits will be shipped by the 1st of the following month, if not sooner. Kits are first come, first served; so make sure you watch for presentation of each new kit on FaceBook and through email. *When the kits are sold out, they will be marked as sold. Right now we have 14 kits available each month and will increase as the demand is needed. Go to our Facebook page and see the cards individually.